MSc and PhD course Plant Protection Biology, NB! The course is full except for students from SLU and LU! 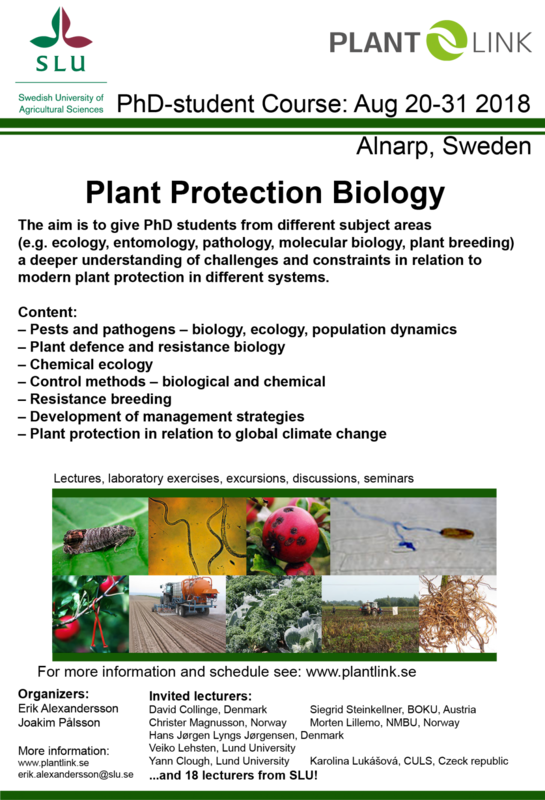 PlantLink > PhD Education > MSc and PhD course Plant Protection Biology, NB! The course is full except for students from SLU and LU! The objective of this bi-annual course is to give PhD students from different subject areas (e.g. ecology, entomology, nematology, plant breeding, molecular biology etc.) a deeper understanding of challenges and constraints in relation to modern plant protection in different systems. For the first time we will also invite a smaller number of ELLS MSc students. Here is the preliminary schedule and the syllabus. Invited lecturers: David Collinge, Denmark Siegrid Steinkellner, BOKU, Austria Christer Magnusson, Norway Morten Lillemo, NMBU, Norway Hans Jørgen Lyngs Jørgensen, Denmark Veiko Lehsten, Lund University Yann Clough, Lund University Karolina Lukášová, CULS, Czeck republic …and 18 lecturers from SLU! NB! The course is now (15 March) full except for students from SLU and LU. If you are not affiliated to these two universities please contact Joakim Pålsson (joakim.palsson@slu.se) if you want to be on the waiting list.